Kennedy states that President Trump has appointed him to head up a task force investigating vaccine safety. The above quote indicates Kennedy, would, if given the green light, probe much more than the use of mercury in vaccines—his main topic of interest thus far. ONE: THE CASE OF JULIE GERBERDING. 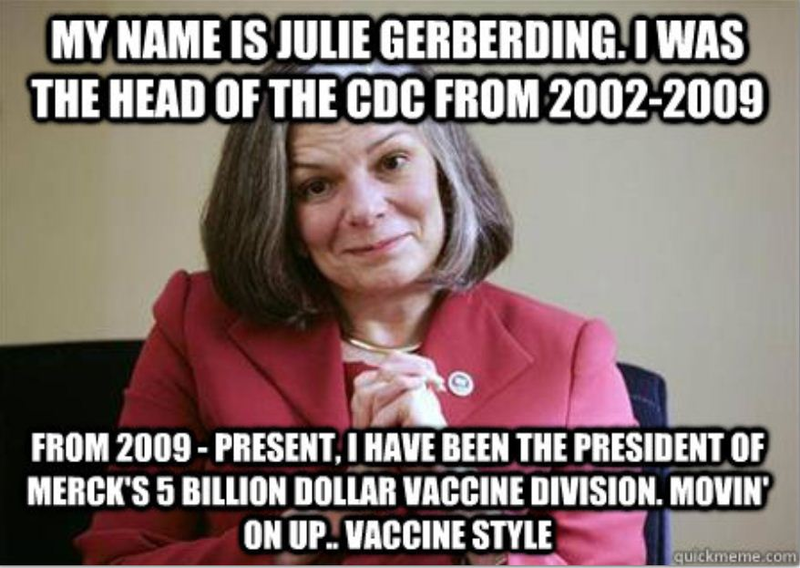 Fast forward: in 2009, Gerberding left the CDC. She eventually went to work as the president of the vaccine division at Merck. Merck. Manufactures. The. MMR. Vaccine. TWO: OVERWHELMINGLY, FLU IS NOT FLU. THEREFORE, EVEN PEOPLE WHO BELIEVE IN THE IMPORTANCE OF THE FLU VACCINE ARE BEING DECEIVED. —Those of you in the Spider group of rebel scientists at the CDC, get busy. There are many more instances of massive corruption at your Agency. Dig in. Don’t let the American people down.